Bill Gutman has written close to 200 books, many of them biographies of sports stars such as Michael Jordan, Brett Favre and Lance Armstrong. 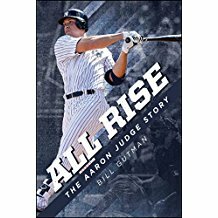 One of his latest, All Rise, The Aaron Judge Story, gives a glimpse into the life of the Bronx Bombers’ slugger. Gutman’s easy-to-read narrative is ideal for young readers. As smooth as Gutman’s prose flows, the book is made even more enjoyable by the first-hand observances of Judge’s adoptive parents, his neighbors and childhood friends from his youth in California, high school college and pro coaches and team executives, sportscasters, and players who competed with and against him in college, the minors and major leagues. These viewsprovide readers with interesting insights into Judge’s youth, his rise to stardom and how he solidified himself as a Major League star. All Rise takes readers through the ups and downs of the 2017 season – from Judge’s meteoric start, to his slump, to his agonizing streak of 37 games with at least one strikeout to his strong rebound in time for the Yankees playoff run. Judge’s on-field accomplishments were historic: He became just the fifth Yankee to hit 40 or more home runs in their age-25 season (joining Babe Ruth, Lou Gehrig, Joe DiMaggio and Mickey Mantle), the first rookie to hit 50 home runs in a season and joined Ted Williams as the only rookies in major league history to have 100 RBIs, runs scored and walks. All Risegives readers a front-row set to relive Judge’s accomplishments. All Rise, The Aaron Judge Story is an enjoyable and informative read for any baseball fan. Click here for more information about the book.